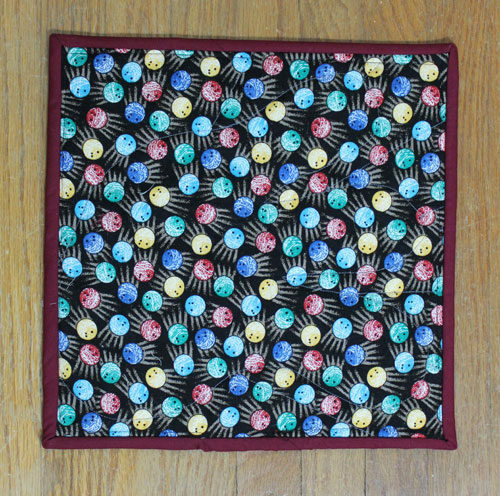 I recently participated in a quilting swap online where each participant made a mug rug for another participant’s husband. Each woman provided a brief description of her husband’s interests, then we made a mug rug (mini placemat) that we thought he would like. 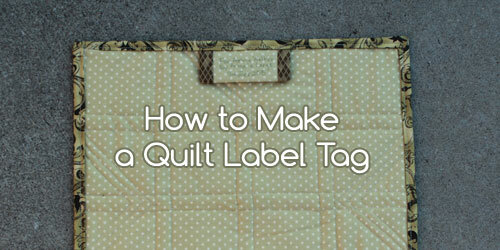 These mug rug projects are a great way to practice your skills in a mini quilt format. This post contains affiliate links, which means that if you click on one of the product links, I’ll receive a little commission at no extra cost to you. I was so happy with who I was matched up with because her husband was interested in bowling. I’m a league bowler with my own husband, so I was really digging the theme. I also just so happened to have some bowling themed fabric on hand in my stash. Bonus, no shopping required! 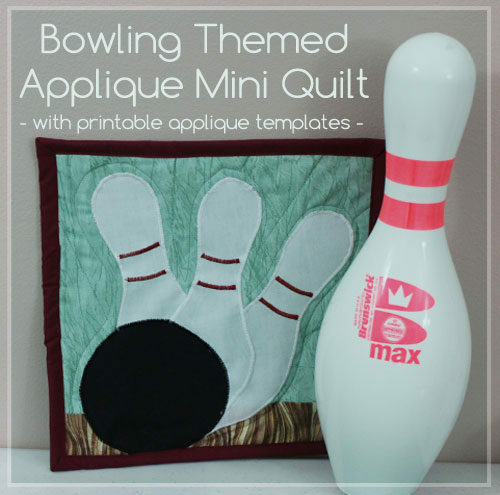 I decided to make my own applique design with two bowling pins and a bowling ball. 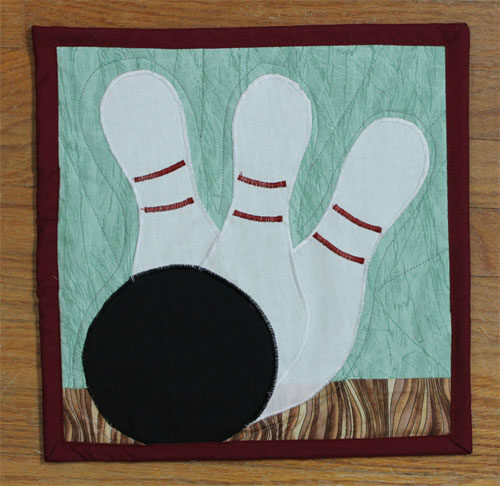 My husband had a great idea of grounding the applique elements on a brown fabric to emulate the wooden bowling lane instead of just having them centered on the mug rug. This is the design I came up with, featuring three bowling pins, a bowling ball, and the wooden lane. The mug rug measures 11″ square finished. 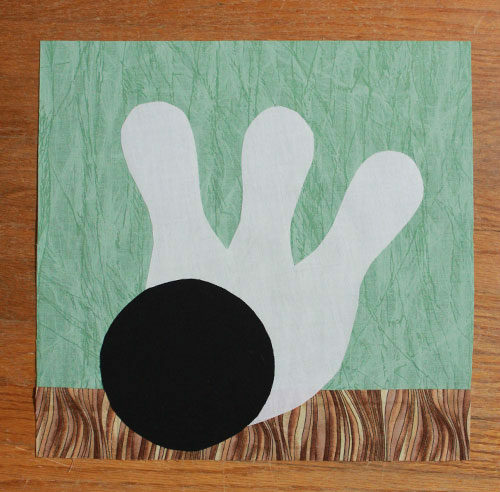 If you’d like to make a similar mug rug, you can download the PDF pieces and print them at 100% size. Please note that these are very rough templates meant to be more of a guide than a precise pattern. 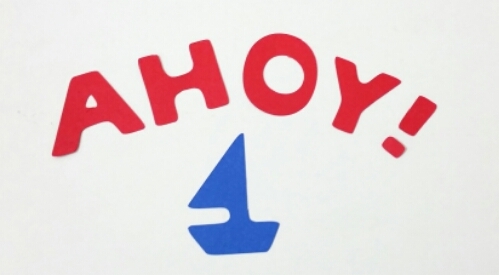 I started by drawing my applique design on construction paper and cutting it out. I played around with the placement, then traced that design onto the paper side of the fusible web. You can use my rough templates above printed at 100%. Although there are three bowling pins, I traced them out as one piece onto the fusible web. Cutting out these pins as one reduces the bulk of the fabric so there are fewer layers, and you can emulate them being separate pins by stitching an outline between them. I’ve indicated where your stitch lines would be on the bowling pin template. When I do applique, I like to use fusible webbing to hold all my pieces in place. 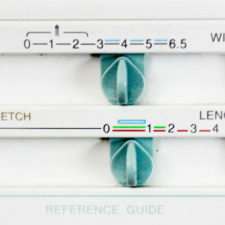 I’m a fan of Lite Steam-A-Seam 2 Double Stick Fusible Web , which you can get on a roll or in sheets. I find the sheets more convenient. I peeled back a layer from my two shapes, ironed them in place on the wrong side of the fabric (white fabric for the pins, black fabric for the bowling ball). I always do a quick peel test before I cut it out to make sure that the glue is sticking to the fabric side, put the paper back in place, then cut out the fabric shape. Always follow the instructions for your particular brand of fusible webbing! 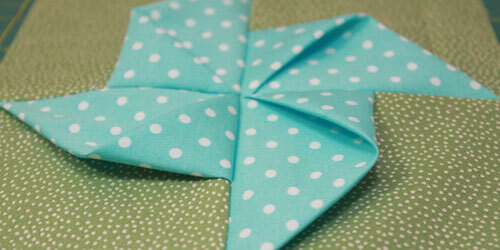 The pieces are ironed into place but are not yet stitched. As you can see, the pins blend into each other as a homogeneous blob. We’ll fix that later! Now the fun part: stitching around the edges to secure everything into place. 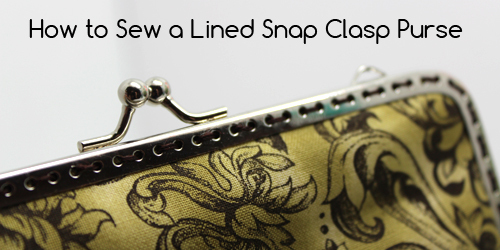 Enter the zigzag stitch. I used white stitches around my bowling pins, black stitching around my ball, and red contrast stitches as the ring design on my bowling pins. 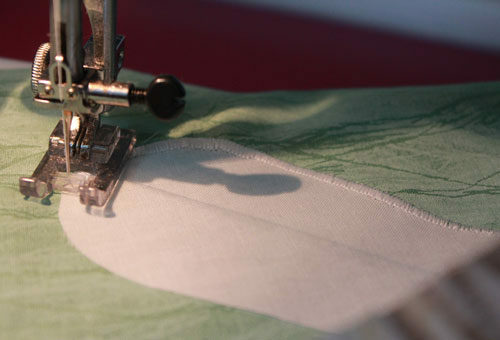 Since stitch settings vary by machine, test them out on a scrap piece of fabric first to make sure you like it before diving into your final project. I decided to go with stitch width of 4 and a stitch length of just a hair over 0.5. 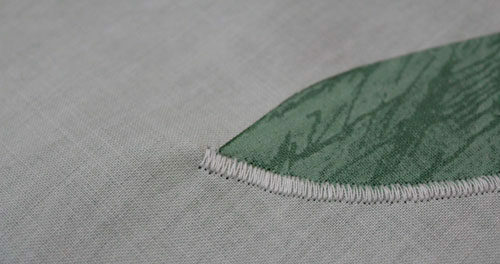 The closer you go to zero, the less space there will be between your stitches resulting in a smoother finish. However, the closer you go to zero, the more apt it is for your stitches to overlap too much, causing your material to bunch and jam. It’s a fine line! Testing your settings is key. The last thing you want to be doing is tearing out all your stitches. 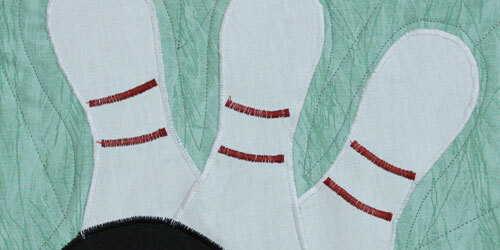 See how your bowling pins stand apart with the stitching? It makes it look almost three dimensional. 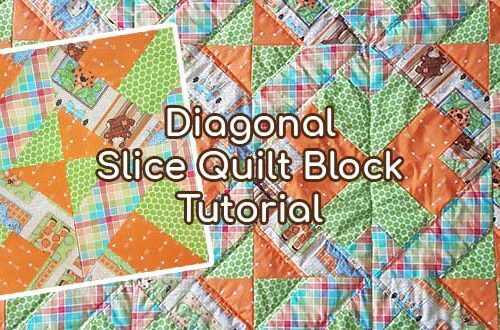 All that’s left is to quilt it, trim it up to your desired size, and bind it! Until next time! Gotta go bowling! Thanks so much for this tutorial! I’ve decided to give everyone in my family a mug rug for Christmas this year. 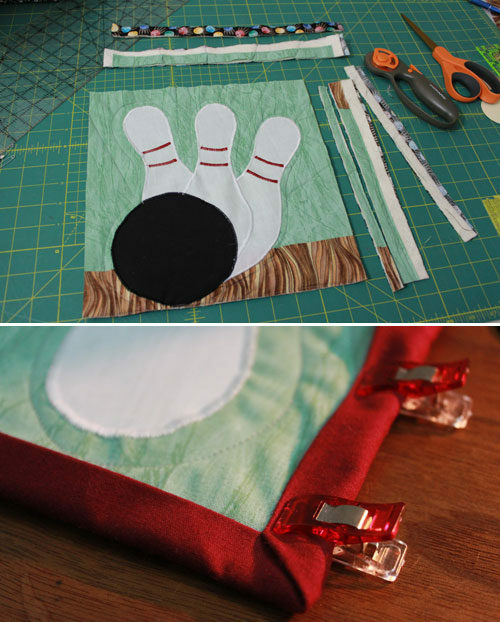 This one will be for my niece who is intellectually challenged but who is crazy about bowling. As a matter of fact, this year she has qualified to attend 2019 provincial special olympics for the first time! She is beyond excited and this little project will thrill her for sure! Thanks again for helping me make one young lady’s Christmas very memorable!